Looking for your next high-performing, yet lounge-worthy mid layer for the ski season? 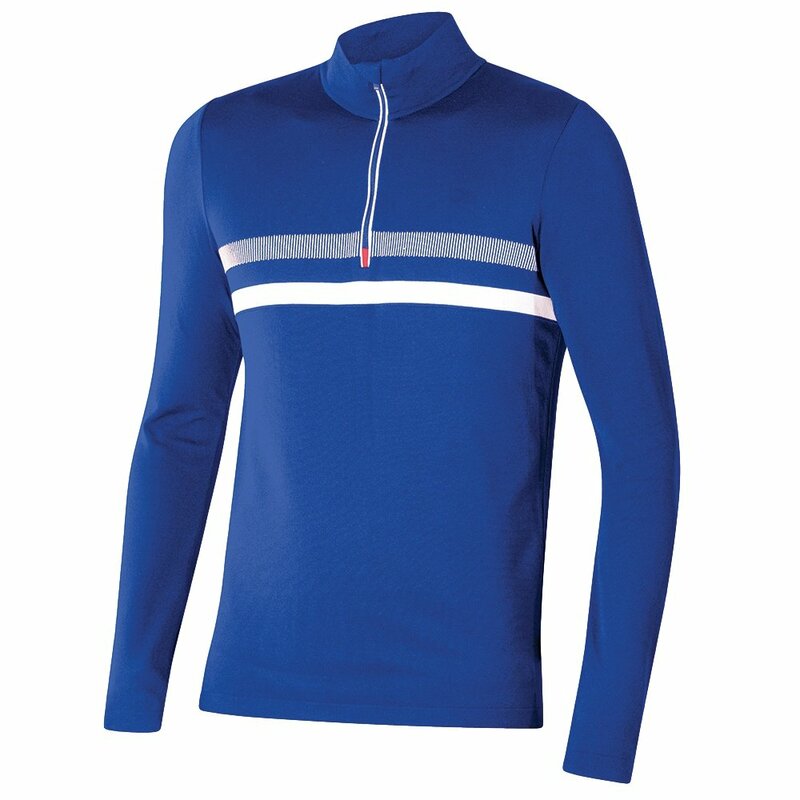 The Men's Valtournenche Half-Zip Sweater from Newland is a tight-fitting ski layer made for wearing beneath your shell. But once you've hit your last legs and it's time to relax in the lodge, the Valtournenche hits its stride, showing off iconic, minimalist style inspired by classic alpine apparel. The geometric, jacquard-knit construction creates a low-profile warmth that is breathable, so you don't get wet with sweat. The top has ribbing at the cuffs and hem for durability and is finished with antibacterial treatment to help it combat odors. "Gift for a college student who is 6’5 & proportionate, usually wears a large in tops. Should I purchase a large or XL in this top?" "Thank you for your inquiry. Unfortunately, we cannot provide you with sizing related answers based on your height, weight and age. To ensure an accurate size, we need you to provide us with your correct measurements. If you need further assistance please contact us at 800-818-0946. " "Any item purchased from PeterGlenn.com can be returned or exchanged within 30 days of purchase, even if you bought it on sale. You may either ship them back to the address below, or return them at a Peter Glenn Store Location. Items must be in new condition with the original tags attached. Peter Glenn does not charge restocking fees, nor do we force customers to take store credit. We will happily refund your method of payment. Just ship the item back to the address below, and be sure to include a copy of your receipt. The customer is responsible for return shipping charges and assumes the risk of loss, so we recommend using a reputable carrier and opting for a tracking number. Have a problem with your order? Please contact us before returning your item as return shipping fees will not be reimbursed. If you'd like to exchange your item, the fastest way is to place a new order for the item that you want and return the original item for a refund. New orders are always eligible for free shipping (excluding international orders), and this ensures that we won't sell out of your item in the meantime. You can also send the original item back to us with a written request for exchange, and we will switch it out when we receive it. Exchanges ship with UPS Ground shipping. International orders are not eligible for exchanges due to the cost involved with duty, taxes and shipping. Simply return the item and we will issue a refund. If you need a different size or color, you will need to place a new order for the new item. Ship returns & exchanges to: Peter Glenn Returns Department 1 Imeson Park Boulevard Jacksonville, FL, 32218 Purchasing a shipping label from us is easy, just follow these three simple steps: Click the "Order Status" link at the top of our website Enter in your order information Print the label for the items you are returning "
"Will you get more of the Blue in a large size in this season? Newland Valtournenche Half-Zip Sweater (Men's)"
"Thank you for you inquiry. Unfortunately we are currently out of stock. We are working diligently on our new inventory. Please continue to monitor our website periodically for new merchandise. We hope this information helps! "